Eurasian beaver Castor fiber, from here. Beavers are one of those animals that are familiar even to people who do not live in parts of the world where you can find beavers. The two living species of beaver are semi-aquatic rodents with one species each native to Eurasia (Castor fiber) and North America (C. canadensis) (though the North American beaver has been introduced to several parts of Europe). Differences between the two are slight: the Eurasian beaver is generally larger (up to 35 kg) and has a somewhat longer skull and a less rounded tail. Beavers are best known, of course, for their construction of elaborate subaquatic nests and dams*. Dams are generally about fifteen to seventy metres across, but have been recorded over 600 metres across (Rybczynski 2008). Beavers may also dig burrows connected to their dams, and construct canals over one hundred metres long (Rybczynski 2008). *The original text here has been edited following Howard's comment below. Phylogenetically, beavers are somewhat remote from other rodents, and represent the last survivors of a once more diverse lineage. First known from the late Eocene, the members of the beaver family Castoridae are divided in the most recent treatments between five subfamilies (Korth 2001, 2004). The plesiomorphic subfamilies Agnotocastorinae and Anchitheriomyinae are not well known, and the Agnotocastorinae in particular may be non-monophyletic (Rybczynski 2007). The remaining subfamilies fall into two distinct lineages: one containing the Palaeocastorinae (Oligocene-Miocene), the other the Castoridinae (Oligocene-Pleistocene) and Castorinae (Oligocene-present). Of these two lineages, only the latter are known to have been semiaquatic: the Palaeocastorinae are strictly terrestrial. 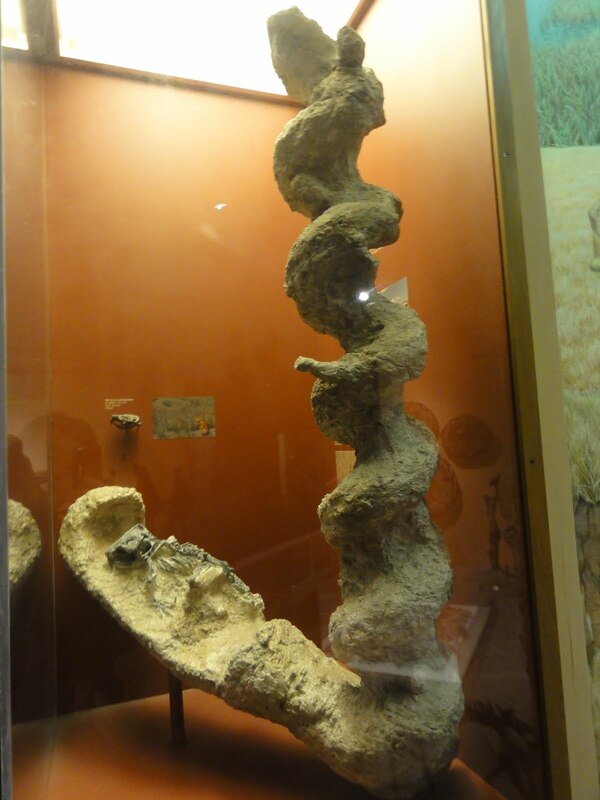 Preserved Daimonelix burrow in the American Museum of Natural History, with specimen of Palaeocastor fossor in the presumed nesting chamber, photographed by Inazakira. The palaeocastorines, a strictly North American lineage, were specialised burrowers. Their incisors, which have rounded faces in modern beavers, became flattened and adapted for digging. Their burrows were distinctive helicoidal structures, described as trace fossils under the name of Daimonelix ('devil's spiral'), that could reach over 2.5 metres in depth and twenty centimetres in diameter. These burrows were constructed in 'towns' with multiple burrows in close proximity. Though each burrow was independent, without connections between adjacent burrows, such close positioning suggests that palaeocastorines may have had a well-developed social structure (Hugueney & Escuillié 1996). However, though the palaeocastorines were much more diverse at their apogee than the castoroidine-castorine lineage, they became extinct after a relatively short period. 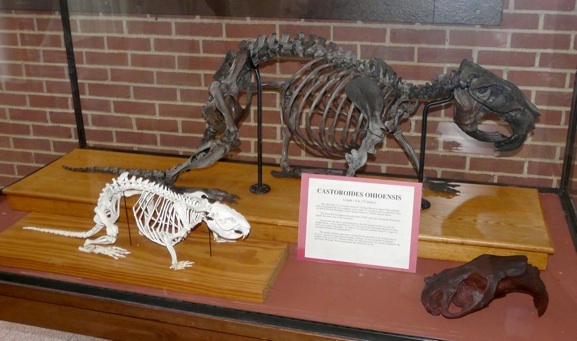 Reconstructed skeleton of Castoroides ohioensis alongside that of (I presume) a modern beaver in Earlham College, from here. The Castorinae and Castoroidinae may never have achieved the diversity at any one point in time of the palaeocastorines, they were more successful over the long haul: the more diverse of the two subfamilies, the Castoroidinae, only became extinct fairly recently. Castoroidines are commonly referred to as the 'giant beavers', and while not all castoroidines were giant (many, if not most, were smaller than modern beavers), the largest of them certainly were: the North American Castoroides reached an estimated size of about 100 kg, and would have been as large as a small bear. Whether the giant Castoroides produced similarly gigantic dams, however, is uncertain. Evidence of wood-chopping behaviour like that known for modern beavers (in the form of preserved wood bearing identifiable tooth marks, in association with beaver remains) is only well supported for one fossil species, the castoroidine Dipoides (suggested evidence for wood-chopping in Castoroides is more equivocal) (Rybczynski 2008). Phylogenetic bracketing between Dipoides and modern beavers would suggest that wood-chopping arose at the base of the castoroidine-castorine clade; alternatively, the absence of direct evidence of such behaviour may suggest convergence between these two species. Also, Dipoides was a less efficient wood-cutter than modern Castor, cutting with the rounded edges of its incisors while Castor uses the flattened ends, and if it used chopped wood to construct nests then they would have probably been correspondingly more simple (beavers also use chopped wood for food, eating the leaves and bark, so wood-chopping does not automatically indicate dam-building). There are other indications that fossil beavers may not have been as specialised aquatically as the modern species: the early castorine Steneofiber, for instance, did not possess the flattened tail of Castor (a flattened tail has been indicated for Castoroides but Castor and Castoroides probably developed such tails independently) (Hugueney & Escuillié 1996). Reconstruction of Trogontherium cuvieri, from Fostowicz-Frelik (2008). Perhaps the primary enigma among fossil beavers is the European Pleistocene Trogontherium. Although also referred to as a 'giant beaver', and often implied to be a European parallel to Castoroides, Trogontherium was a quite different animal. Fostowicz-Frelik (2008) argued that leg proportions and other features indicate that Trogontherium was a more terrestrial, cursorial animal than other beavers (in particular, its narrowed rather than flattened toe bones suggest that it lacked the webbed feet of modern beavers). The phylogenetic analysis of beavers by Rybczynski (2007) placed Trogontherium as closely related to Castoroides, but certain plesiomorphies in its tooth morphology lead Rybczynski to suggest that this position was probably an artifact of convergences due to large size, and that Trogontherium should perhaps be in a much more basal position. Fostowicz-Frelik, Ł. 2008. First record of Trogontherium cuvieri (Mammalia, Rodentia) from the middle Pleistocene of Poland and review of the species. Geodiversitas 30 (4): 765-778. Hugueney, M., & F. Escuillié. 1996. Fossil evidence for the origin of behavioral strategies in early Miocene Castoridae, and their role in the evolution of the family. Paleobiology 22 (4): 507-513. Korth, W. W. 2001. Comments on the systematics and classification of the beavers (Rodentia, Castoridae). Journal of Mammalian Evolution 8 (4): 279-296. Korth, W. W. 2004. Beavers (Rodentia, Castoridae) from the Runningwater Formation (Early Miocene, early Hemingfordian) of western Nebraska. Annals of Carnegie Museum 73 (2): 1-11. Rybczynski, N. 2007. 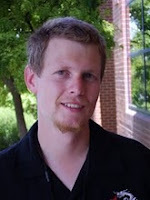 Castorid phylogenetics: implications for the evolution of swimming and tree-exploitation in beavers. Journal of Mammalian Evolution 14: 1-35. Rybczynski, N. 2008. Woodcutting behavior in beavers (Castoridae, Rodentia): estimating ecological performance in a modern and a fossil taxon. Paleobiology 34 (3): 389-402. "the North American beaver has been introduced to several parts of Europe"
...and also to the southernmost parts of South America. "Differences between the two are slight"
Interestingly, however, they seem to be incapable of interspecific hybridisation. On the other hand, their morphological and ecological similarity does obviously raise the question of whether they can coexist in the wild. Anecdotal evidence from countries where both species now occur (e.g., Finland) unfortunately suggests that the answer is 'no', and that the introduced North American species is able to outcompete the native Eurasian beaver. Anecdotal evidence from countries where both species now occur (e.g., Finland) unfortunately suggests that the answer is 'no', and that the introduced North American species is able to outcompete the native Eurasian beaver. Apparently it's a bit more complicated than that. The North American beaver has been displacing the Eurasian in more northerly regions (Finland, northern Russia), but the Eurasian beaver has held the advantage in more southerly locations (Poland, France). "The North American beaver has been displacing the Eurasian in more northerly regions (Finland, northern Russia), but the Eurasian beaver has held the advantage in more southerly locations (Poland, France)." I don't know the specifics regarding the situation in Poland (e.g., how extensive were the introductions of canadensis there? ), but in France, it seems, the two beaver species never were truly sympatric. A small population of North American beavers (not intentionally introduced; they were escaped zoo animals) was present in France in the late 1970ies and early 1980ies, but they were eradicated* by humans (Moutou, 1997; Halley & Rosell, 2002). * Recently, individual North American beavers have again been found in France and adjacent areas in Germany, Belgium and Luxembourg (Dewas et al., in press). Their exact origin, AFAIK, is unclear. But yeah, I concede your general point; the issue of interspecific competition between the two beaver species does seem to be complex. 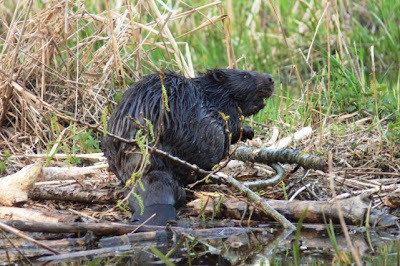 Dewas, M., Herr, J., Schley, L., Angst, C., Manet, B., Landry, P. & Catusse, M. in press: Recovery and status of native and introduced beavers Castor fiber and Castor canadensis in France and neighbouring countries. Mammal Review. Halley, D.J. & Rosell, F. 2002: The beaver's reconquest of Eurasia: status, population development and management of a conservation success. Mammal Review 32:153-178. Moutou, F. 1997: Mammifères aquatiques et semi-aquatiques introduits en France. Risques et conséquences. Bulletin Français de la Pêche et de la Pisciculture 344/345:133-139. The white skeleton can scarcely be an adult beaver! I've seen a beaver skeleton, and it is quite large. Perhaps it is a muskrat? 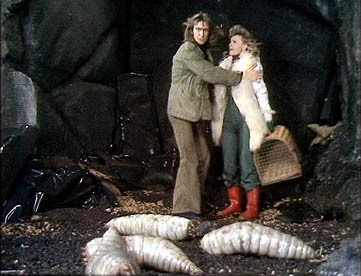 Castoroides got to 2.4 metres long, Castor to about 1 metre. It seems about right to me. A small clarification regarding the dams. Your description seems to conflate dams with the beavers' living quarters. Beavers don't live *in* the dams; they live in a lodge, which is a subcircular dome structure constructed in the dammed pond, completely separate from the dam (see, for example, the Wikipedia article on "beaver"). The dam's only purpose is to create a pond of water deep enough to allow the beavers to enter and exit the lodge underwater, even in winter when the pond surface is frozen. Tunnels/burrows are constructed in river banks or lake shores and substitute for a lodge where a sufficient depth of water in the river or lake obviates the need to build a dam. Thanks for that, Howard. That was indeed a misunderstanding on my part. The Castor canadensis skull on my bookcase is 14 cm long by 10 cm across: adult, but not a giant, so the white skeleton size looks okay to me too. Banfield's The Mammals of Canada gives their weight range as 15-35 kg and the record as '90 pounds' (~41 kg). The ones my wife has weighed after de-miting were up to 30 kg, so perhaps the Eurasian Beaver is not larger than the North American one (or at least the Canadian ones). A few years ago the population of beavers on our lake all died out over the winter from a form of tularaemia (Francisella tularensis holarctica) and similar epizootics seem to have a long historical record here. Given the biotype name holarctica, I suppose this pathogen must occur in Eurasian too, but I would expect variation in pathogenicity. I wonder if disease is playing a role in the interactions between the two species in Europe.